Psssst...have you heard the news? It's finally here!! K.I.S.S. Club Creations! 1. What is K.I.S.S. Club Creations? It's a year long, monthly page kit club, shipped and billed automatically each month. You can choose from one of three clubs, Sweet Girl, Oh Boy! and Everyday Moments or any combination of the three. Sweet Girl will focus on the girls in our lives, Oh Boy! will highlight that rough and tumble boy and Everyday Moments will focus on generic, everyday life happenings not Holidays. 2. How much is the club and how long am I committed? Each club will include a double page, 12 x 12 layout, full color instructions, embellishments and all materials precut for you. The cost of the club is only $10.99 each with a shipping fee of $2.99 per month. Purchase more than one club and you only pay shipping for one! Your first payment will be charged immediately with future monthly payments being automatically charged on the 5th of each month. K.I.S.S. Club Creations is an auto-ship club, this means that you will continue to receive a kit each month until you cancel your membership. You may cancel at anytime prior to the 1st of the month with no cancellation fee. Kits will ship between the 20th - 25th of each month to all accounts in good standing. No skips or returns unless item is damaged or incomplete. Orders placed after the 5th of the month will begin club membership the following month. Example: Purchase club on January 7th, your first kit will begin with the February kit and will ship around February 20th. 3. Why should I choose K.I.S.S. Club Creations? We specialize in pre-designed kits that feature multiple photo mats along with lots of embellishments, custom K.I.S.S. Cuts and great designs. Our pages showcase on average a total of 8-12 photo mats ranging in sizes including 5 x 7, 4 x 6 , 4 x 4 , 3 x 3 and more! We design our pages for those that are limited on time, like to get lots of photos on a page and desire a design that compliments your photos while looking great!! A few basic supplies and about 30 minutes and you'll have completed pages. Just think you could have up to three COMPLETE albums at the end of 2010! 4. Can I see a preview of the K.I.S.S. Club Creations? While we can't guarantee a preview of each monthly club we will certainly try to update the K.I.S.S. Blog and Facebook Fan Page with the new monthly kit images prior to shipment. 5. Can I buy a kit without signing up for the club? Sorry our K.I.S.S. Club Creations are limited to members only and limited in quantity. On occasion we may have additional Club Creation kits which will be sold online at a price of $12.00 plus shipping and applicable tax. Christmas is officially over but not here at K.I.S.S. Scrapbooks! We promised you 12 Days of Christmas Specials and that's what you are going to get! For our 12th and final sale of 2009 we couldn't go out small!! No way!! We are going out BIG with BIG savings for you!! This means you will get 6 kits for the price of 5 AND FREE shipping!! WOW! Hurry, this is for a limited time. Discount code and sale will end January 5th!! All orders placed during the 12 Days of Christmas Specials will ship no later than January 5th and will ship in order received. If you have special shipping request please add it to the comments section during checkout! Day #11 Special - Merry Christmas Eve!! With only one day until Christmas we've got a special only good enough for Christmas Eve!! We've opened up all the 12 Days of Specials from today until December 26th AND we are offering 15% off all other items on the website!! Merry Christmas to all!! Day #10 - You've wrapped the presents, you add the name and then the bow...the package is perfect. Ink does the same for our pages. It adds that finishing touch that brings it all together and nothing is better than the Cat's Eye ink pads! Rich, thick, ColorBox pigment inks are acid free, fade resistant and unsurpassed for stamping on absorbent papers where sharp detail is desired. Inks dry slowly and offer generous working time for embossing powders to adhere to. You will get an assortment of 10 Cat's Eye ink pads in the most popular colors for only $14.99!! That's like getting 3 free!! Day #9 Special - It's coming up....FLOWERS!!! What possibly could be better than Prima flowers? Chocolate perhaps but it sure doesn't work well on our scrapbook pages!! $15.00 - $20.00 worth of Prima flowers for ONLY $10.99! 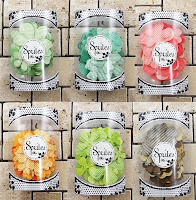 You will get an assortment of Prima flowers, colors and styles will vary. Value of flowers will be $15.00-$20.00. Day #8 Special - With only 5 days until Christmas that also means we are nearing a new year. We are offering two different calendar options with this special or even better, buy one for yourself and one for a friend! All you need to complete an entire 12 month calendar! 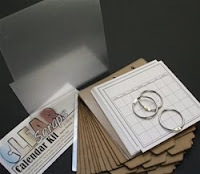 You will receive 12 Chipboard Tabbed pages, 2 Acrylic covers, 12 blank Calendar pages, 6 x 6 acrylic book stand and 3 rings. Perfect idea for a gift, make 2 one for you too!! You could also make this into a Recipe Calendar Project! Only $15.99 each!! Original price $24.99!! This fun Calendar Kit designed by K.I.S.S. Scrapbooks measures an incredible 12 x 23″! Featuring Daisy Bucket Designs Chipboard Shapes, K & Co. papers and fun embellishments. Kit will include all papers, embellishments, chipboard pieces, calendar pages and full instructions to assemble this awesome calendar. Can you believe we are down to just 5 days until Christmas and you only have a few hours left to snag on of our awesome Day 6 Specials before they are all gone! Day #7 - Christmas is nearing, you've been busy shopping for all the kiddos and loved ones and now it's time to shop for YOU!! 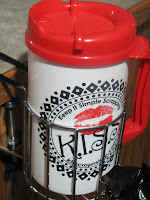 What could be better than a FREE 32 oz custom K.I.S.S. Mug and the high in demand Scrap Ma Bob!! You'll be the coolest scrapper on the block with this combo!! Sale dates valid December 20th-22nd. **If you'd like to save on shipping mark HOLD in the comment section during checkout and we'll ship all your orders together. Free shipping at $50.00 EXCLUDES storage items. Actual shipping charges will apply and be charged at time of shipping. Day #6 - Paper by the Pound! Here's one time where you can gain a pound or two and be very happy about it!! Paper by the Pound, what could be better? Retail value is $.79 - $1.20 per sheet. Paper will be weighed and sold as 1 lb units. Approx. 35-45 sheets of paper per pound, will vary depending on paper type. All papers are some of my personal favorites, Bo Bunny, Imaginsce, Best Creations, Fancy Pants just to name a few. Most papers are double sided. Limit 3 lbs per person. Sale price valid December 17th-20th. Don't forget to mark 12 Days of Christmas in your comment section during checkout to combine your orders and save on shipping! No, we are not talking the famous Sonic Brown Bag Specials, we are talking a brown bag FULL of embellishments! Anything and everything you can imagine at the crazy low, low price of $5.00 per bag. Retail value of items if purchased individually would be approx. $20.00!! Limit 5 per customer, no two bags will be exactly alike. Shimmer and Shine, isn’t that what we all love? Glimmer Mist is one of my new favorite supplies! It can be used on just about anything, from chipboard to paper, from flowers to ribbon there is no limit to what you can do with it! So easy to use, a simple spray and you’ve added shimmer and shine to any project. Try Glimmer Mist today at the incredible price of $15.00 for 3 assorted 2 oz. bottles. That’s like getting one bottle free!! Colors will vary from those shown. Sale price good from December 14th - December 16th. All that glitters is not gold....but it can be gold, silver, red, blue and frosted!! What are we talking about? Stickles of course, the very best kind of glitter! Get the gift of glitter in a surprise assortment of five .5oz bottles of stickles for ONLY $7.00!! *Colors may vary from those listed however each bottle will be a different color and all colors will be YUMMY!! 25% off my favorite adhesive!! Go check it out, limited time offer!! Don't forget you can put "12 Days of Christmas" in comments section at checkout and we'll hold your order until the final sale to save on shipping! 12 Days of Christmas Special! Check back now until Christmas for our 12 Days of Christmas Specials. We can’t tell you what days or what goodies we might have on sale but we can tell you there are going to be 12 sweet deals now until December 24th!! Specials may last for one day to several days, some may be limited in quantity, they will all be sweet!! DAY 1 SPECIAL - For every $20.00 in gift certificates purchased, get an additional $5.00 gift certificate! That means you can buy your best friend a $40.00 gift certificate and you can get yourself a $10.00 gift certificate! Special valid December 3rd-5th. *Free gift certificates will be sent automatically to purchaser unless noted otherwise in comment section at checkout.